The earth is spherical and we can quickly see that the edge of the sea shades our view. For instance, the top of the mast and the superstructure are the first that can be seen of a vessel. When we stand on a shore on a broad fjord, we do not see the shore on the other side, but we can see the landscape above the shore very well. When you are at five metres above sea level, the horizon is five nautical miles. The beam of light becomes clearer as we come nearer to the lighthouse. 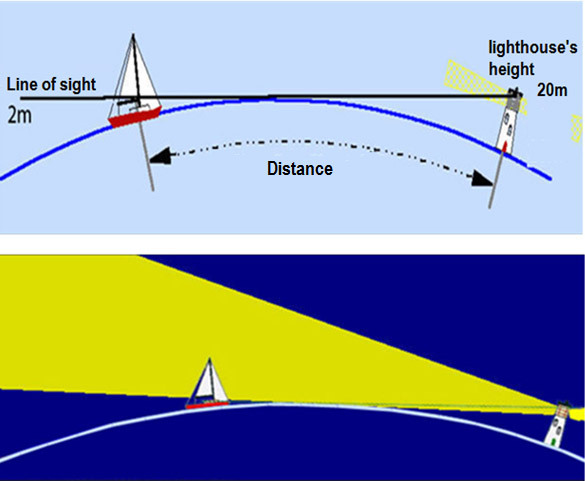 This table shows when the light on lighthouses becomes visible when sailed towards the lighthouse.